The mYouth 2.0 project – Mobile, Young, Opportunity, Unity, Technology, Help is particularly dedicated to provide space for youth that is already in the field of new technologies and develop further their potentials by providing them with new ways of personalized, learner-centered, situated, collaborative, ubiquitous, and lifelong learning. WHAT IS mYouth 2.0 ABOUT? 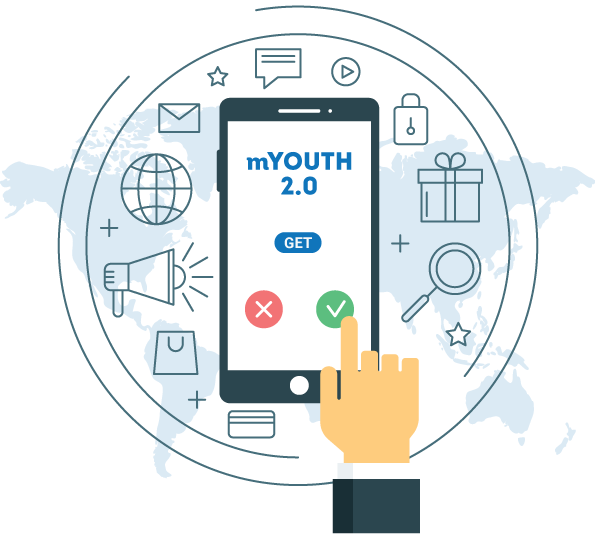 The Capacity Building project mYouth 2.0 expends beyond the achievements of the first edition that was implemented in 2016 where 10 mobile apps were developed and competed for the European Youth Summit Award (https://eu-youthaward.org/) and World Youth Summit Award (www.youthaward.org). The new version of the project mYouth 2.0 (Mobile, Young, Opportunity, Unity, Technology, Help) involves more countries from 3 different continents: East African Region ( Kenya and Tanzania), West African Region ( Senegal and Ghana), North Asian Region ( Vietnam and Hong Kong) and South Asian Region ( Singapore and Philippines) as well as the European Region that will involve Poland, Germany, Austria, Macedonia and Romania. Coding is not anymore a skill for professional programmers and the ability to code, like the ability to read and write, becomes an essential part of fluency in today’s society. Knowing how to code is a valuable employability skill, as the number of jobs for programmers and computer scientists is growing rapidly. Many jobs of the future would require these skills as invaluable asset. So, what makes mYouth 2.0 so interesting? 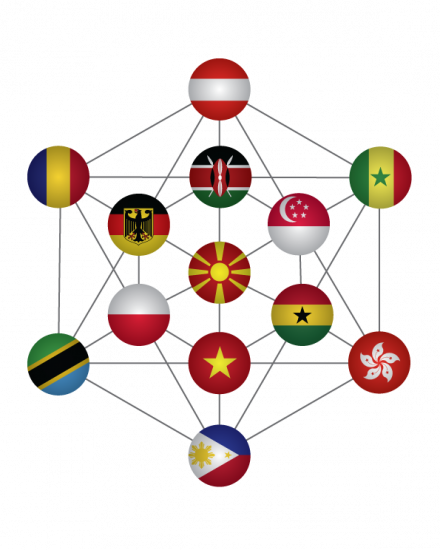 In January 2018, representatives from 13 countries which partner this project unite in Singapore to launch project activities and discuss the crucial aspects of building a strong digital community, and how such community can provide youth with opportunities to share their knowledge, harvest new skills and get them be more active and aware of their needs within their local communities. Furthermore, National Mobile Apps Competition will follow in 12 countries, organized in February and March 2018, where 3 best mobile apps from each country are going to be selected. 36 project participants from the 12 countries on 3 continents will take part in the Continental Mobile Apps Hackathones, have their knowledge expanded and their skills boosted in regard to learning-to-code and coding-to-learn activities. The knowledge they gain will be lifetime experience that can further help them to attract funds for their startups. 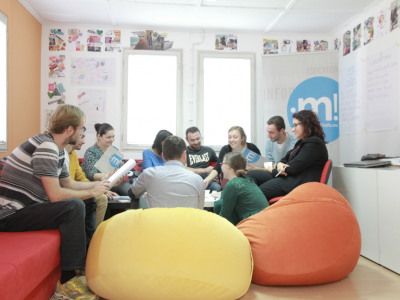 The 12 winning teams will participate on a training course in Macedonia and learn about business model canvas, go-to market strategy, marketing plan and attracting investors. The training will provide the opportunity to meet potential investors through our Romanian partner and get a chance to secure funding in order to support their start-ups. Further on, a jury will select 3 best mobile apps from each continent that will have the chance to compete for the European Youth Award/World Summit Youth Award competitions. The 3 best mobile apps will have the opportunity to attend the European Youth Award GALA Ceremony that takes place in Austria from 28 November – 01 December 2018 where the three selected best mobile apps in the separate category myouth will be presented, as well as pitch their idea in front of jury members on stage. The best mobile app in this category will be selected and awarded. Mladiinfo International along with the project partners, aims to discover brand new worlds and potentials through the mYouth 2.0 project. mYouth aims toward pushing the boundaries of the mLearning educational model, and making education more accessible to those who face significant barriers to learning. Those barriers as already mentioned could be either caused by environmental or infrastructural challenges; or, due to living in rural and remote areas; dedicated to all those who are being too mobile and engaged with other work, or other activities that make them unavailable to attend proper educational institutions. Learning from mobiles could change all of that – could serve ad hoc learning material to each individual, as it created learner-centered environment for all. The best of all – it is free. The implementation of the mYouth 2.0 project involves diverse partners from 3 continents who would generate substantial results on a European level, and also beyond European borders, in terms of youth development through non formal education and increasing the self-employment among youth through the process of setting up new global start-ups. The added value lies in supporting the capacity building of human resources and increasing the digital competence of youth because coding enhances creativity, teaches people to cooperate, to work together across physical and geographical boundaries and to communicate in a universal language. If you want to read more about the mYouth 2.0 achievements click here. mYouth 2.0 is your getaway to the world of mobile learning. If you have a developed mobile application (at least in Beta version) which can serve global youth and their access to education, you can now apply to participate in the project, share it and win with it! © 2018 mYouth. All Rights Reserved.